The name Faun enjoys a good image and a long history. The company was founded in 1845 as a foundry in Lauf an der Pegnitz. In the nineteenth and early twentieth centuries, the family company made fire department equipment and small machines, later mainly lorries, military and commercial vehicles and agricultural machines. In the 1960s, Faun stopped making medium-sized vehicles and focused on making high-quality cranes, tractors, bulldozers, excavators and heavy-duty trucks. After a crisis in the 1980s, Faun was sold in 1990 to Japanese crane manufacturer Tadano. The company is now called Tadano Faun GmbH and exclusively makes special vehicle-mounted and mobile cranes and special military vehicles. Faun’s truck-mounted cranes are now manufactured by the TADANO Group in Japan and the U.S. as well as at the main factory in Lauf an der Pegnitz. Older models and the current generation of mobile cranes are both very popular in used condition and are used worldwide in heavy haulage, in the building industry, in forestry and in specific disciplines such as pipeline construction. The current Faun models include the HK 40, HK 65 and HK 70 mobile cranes with maximum load capacities ranging from 40 to 70 tonnes. The smallest model, the HK 40, offers a load capacity of 40 tonnes and a tip height of 47.5 metres. The HK65 mobile crane can handle a payload of up to 65 tonnes with a tip height of 60 metres, while the largest vehicle, the HK 70, can handle an amazing 70 tonne payload with a tip height of 64 metres. 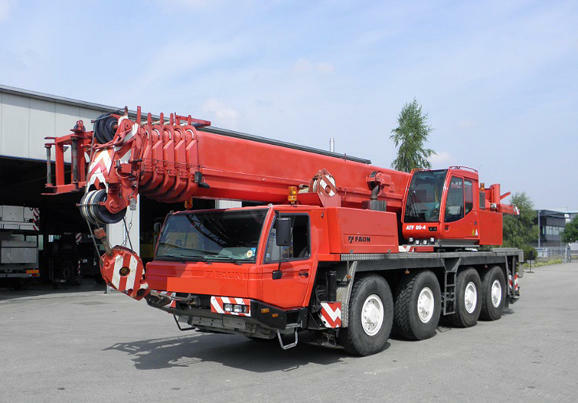 Tadano Faun GmbH also specialises in restoring its used mobile cranes. The company overhauls, repairs, paints and updates the used cranes to the latest state of technology before putting them back on the market. The high quality of these devices makes these an affordable alternative that have many remaining years of useful life in construction and transportation.